Mast and aerial are down! After the recent heavy winds in Scotland it’s now time for the south of the country to get them and we’re forecast winds of up to 65 mph at some point over the next few days which equates to Storm Force 10. My Alimast from Aerial-Parts of Colchester hasn’t been lowered since it went up. The day we finished everything off was a bit chilly and so we didn’t want to put too much strain on the chemical anchors holding the winch in place and I’ve not had the opportunity yet to test everything out. When I heard about the weather forecast earlier today I decided that I wanted to lower my mast and aerial, just to be sure. Because it’s not been raised or lowered on just the winch yet I thought it better to be prudent and get some friends around to assist so after a couple of phone calls both Yan, M0YNK and Colin, M1EAK agreed to help and were on their way. Chris, M6GSD and his lad turned up as well. In the end, it went perfectly. Yan shinned up the ladder and removed the restraining arm (this will eventually have some kind of quick release mechanism on it so it can be removed without needing a ladder and spanner) and then it was a simple matter of just getting the mast moving and then winding it down using the winch. We had to stop a couple of times on the way down to move my ‘long dangly thing’, the 40m dipole and to untie the washing line but the winch held it perfectly and didn’t skip a beat. 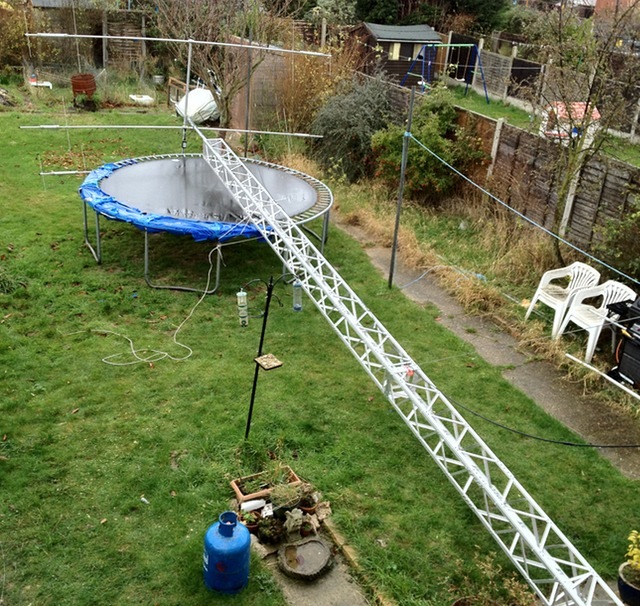 I ended up with the mast down and supported by being strapped to the trampoline and by the winch wire. As before, it looks absolutely huge when it’s down. This will give me the opportunity to adjust the aerial so that it properly covers 20m as it currently matches just outside the band and also to fit a couple of hundred cable ties to the elements and boom to prevent starlings using it as a perch. I don’t want to see it like this any more. Although it was forced on me today, I’m very pleased that I’ve been able to try the winch mechanism on the mast because it hadn’t been fully tested previously. All that’s left now is to replace the two shackles which are being used as a pulley, to fix the foot of the mast and sort a quick-release restraining clamp. Once these are all done I’ll be able to lower and raise the mast by myself which was one of the key objectives behind doing all the work. 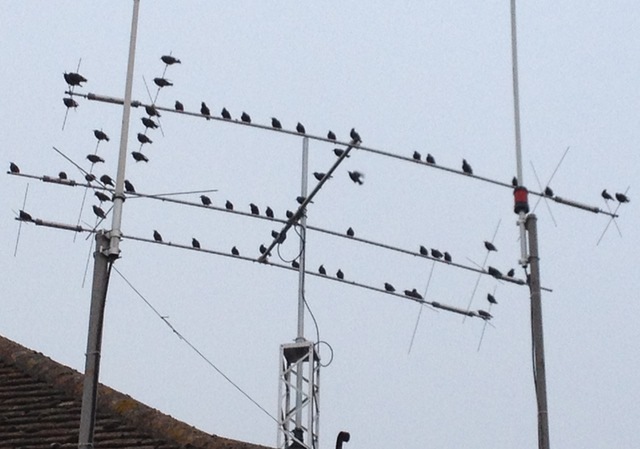 This entry was posted in Amateur radio and tagged Aerial-Parts of Colchester, Alimast. Bookmark the permalink. One Response to Mast and aerial are down!